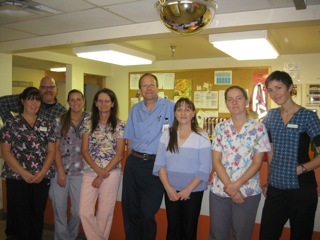 These patient safety stars at Olive Devaud in Powell River have been inspired by Brenda & Terri. Both Len Wegner, Manager & Margaret Wrotny, RCC are proud of the team! Spreading the patient safety message among healthcare staff is no small task. Not to mention, influencing those staff to be enthusiastic about using an online safety event management tool in addition to an already busy day caring for patients. But, that’s exactly what’s happening in Vancouver Coastal Health (VCH) as a result of a unique and special partnership between an inspired clinical leader and a technical expert. Brenda Bailey, Clinical Nurse Specialist, and Terri Aitken, Coordinator, have joined forces to promote the benefits of the Safety Learning System (SLS) as a tool to promote continuous learning, enhance communication and support overall improvement in patient safety and quality of care. With a passion for Gerontology and 15 years’ experience as a Clinical Nurse Specialist, Brenda says her responsibility is to oversee the quality of clinical practice in eight residential care facilities along the coast from the North Shore to Powell River. A couple years ago she became interested in SLS, knowing that the system could help her to identify areas of care that needed improvement but, without a technical background, she knew she needed Terri’s in-depth knowledge of SLS. Since then, Brenda and Terri have continued their dynamic partnership and worked together to demonstrate the value of reporting safety events in SLS and, more importantly, their efforts are working to build capacity and raise awareness within each residential care facility on the coast. Both Brenda and Terri are quick to compliment the efforts of the other, which is a true reflection of the special bond they share. “It’s all about you, Brenda!” says Terri. Their combination of clinical and technical expertise is a great example of what can be achieved when two minds come together to focus on improving patient safety.